ACTYGREF: for grafting operations. ACTYGREF helps to overcome the biochemical deficiency of the callus, by establishing a better vascularization. CIRKA: for planting. CIRKA has been formulated for the already formed callus. Under hot temperature, between 85°C and 90°C, its high melting point together with its plasticity and impermeability give a complete protection. First use: CIRFLEX is applied just after callusing and before planting. Second use: Once the grafts have been uprooted, CIRFLEX prevents the plants from dehydration when they are stored in cold rooms. STARWAX: for planting and display. STARWAX is a perfectly neutral wax, which contains a non phytotoxic additive and gives a homogeneous, deposit free product. It is made of micro particles of light metals which reflect 90% of solar or artificial rays, ambient UV and IR rays. STARWAX brings effective protection for the callus and young vegetation. Custom wax : With the help of his laboratory, QUIMIWAX can also fulfill specific requests and produce special waxes according to your needs. All waxes are available in either, white, red and green colour. Waxes are available in either 5 kilo slabs (25 kilo boxes) or 25 kilo pellets. Indeed, for twenty years, QUIMIWAX has been manufacturing a range of waxes for grafting vine plants, roses and ornamental plants. QUIMIWAX waxes are the outcome of many comparative tests carried out by professionals and whose results are certified by a laboratory. QUIMIWAX waxes are microcrystalline waxes, produced by de-oiling petrolatum, which In contrast to the more familiar paraffine waxes, are small and thin, making them more flexible. Waxes possess all the qualities of a good grafting wax should have, which are the plasticity, the adherence and the hardness. 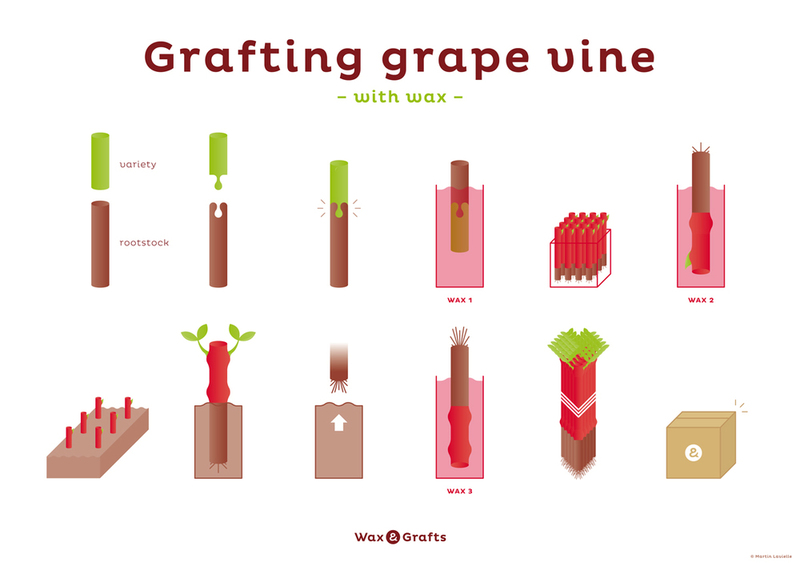 A good grafting wax should then be flexible and resistant at the same time.